The Thule Quest Cargo Bag provides you with up to 13 cubic feet of extra cargo space. It easily attaches to aftermarket and factory-installed roof racks. With its modern style, it won’t look like an eyesore on top of your car. Storm flaps with Velcro fasteners will keep it firmly attached to the roof of your car. This bag is equipped with heavy-duty molded handles. The bag also comes with its own stuff sack for easy transport and storage. When not in use, you can simply keep it under your car seat or in the trunk. 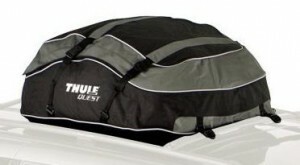 The Thule Quest Cargo Bag has collected 48 customer reviews on Amazon.com so far. Reviews are generally positive, with 35 customers giving it a rating of 4 stars and higher. Most users enjoyed the product for the great extra storage space and convenience it offered. Doesn’t provide adequate protection against water – Although the manufacturer advertises this bag as water-resistant and not exactly waterproof, some customers felt that it still under-delivers. Reviewers were surprised at the amount of water that found its way into their bags after driving through light to moderate rainfall. Not very durable – A number of Amazon reviewers also reported that their cargo bags started falling apart after a few uses. The most common complaints were seams ripping apart, the inner lining shredding off, or the zipper getting broken. Easy to attach and remove – The cargo bag is delightfully quick and easy to attach to a roof rack. It’s also just as easy to take it off. When not in use, the bag can be folded and stored inside its included carry case. Ample space and secure storage – Although there were complaints about the bag not really being very weatherproof, most customers agree that it does provide reasonable space for all your luggage. And with its four sturdy straps, the bag doesn’t flap or move around on top of your car while driving. Based on all the reviews so far, the Thule Quest Cargo Bag sounds like a good product. You will be satisfied with its performance as long as you have realistic expectations. It’s only water-resistant, not waterproof, so covering your belongings with plastic bags is definitely a good idea. This bag, as most customers noted, is also really easy to attach to the roof rack. And as long as you make sure to tighten the straps, you can expect to have a smooth drive for hours.